There is so much going on currently in South Africa that we seem to overlook the possible impeachment of President Zuma on corruption charges. Way back when, there was Shaik Shabir who got a jail sentence for his part in some very dubious transactions which included our president. Yet nothing was done to follow up on any of Zuma’s wrongdoings. Now we have the much anticipated “Spy Tapes” which after all this time hopefully remained relatively intact. 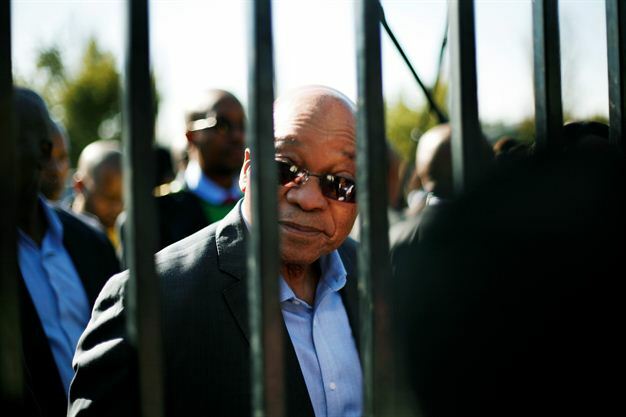 Using the information may just be the catalyst to topple Zuma from his throne. Rumours abound that the ANC would also like to get of Zuma but they are still trying to work out just how this should be done. Will they be able to get him immunity from previous transgressions, will they be able to keep him from spilling the beans on the rest of them? Or in keeping with African tradition could we see the people rising up and forcibly removing him from office? A few years ago I would have said that there would be no way that the general member of the ANC would have muttered any discontent with the ruling hierarchy of the ANC. Now I am finding that since Nelson Mandela passed away there seems to be an undercurrent in the masses starting to voice their opposition to the total lack of delivery that has dogged them since 1994. The glue that held the ANC together then, has now started to crack away. The breakaway of my good friend  Julius Malema has shown just how vulnerable the ANC is to former support being lured away. The EFF has some radical ideas which even they know are not really workable yet their numbers are growing with voters moving from the ANC to the EFF. 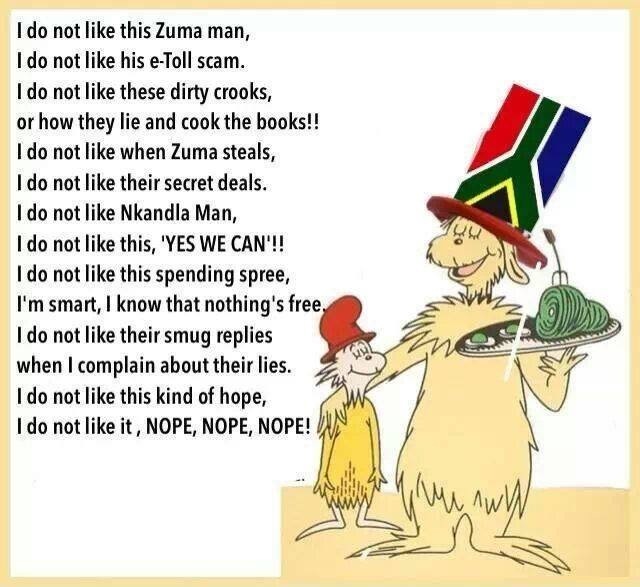 Let’s keep our fingers crossed that once President Zuma is no more, and in some miraculous happening, we end up with someone who is able to start with the cleaning out of all the dead wood that makes up our government and municipalities. Should this start happening, there will be a major swing to people who respect the laws of our country and are willing to stand together to create a better future for all. Read today about the R16 million spent on landscaping at Nkandla. 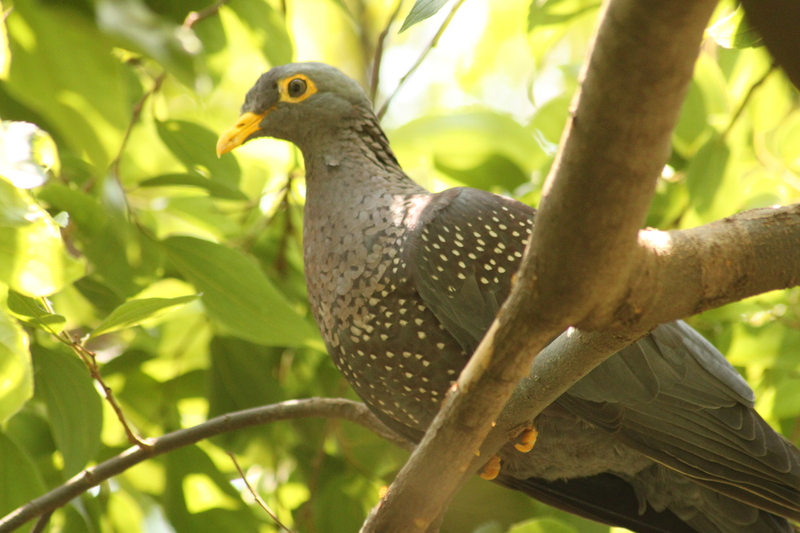 What has the buying of trees and Cycads got to do with security? Or could it be that we will soon hear that his security detail needs to practice bush warfare in his kraal? I received this via email this morning and have read something similar in the past but I thought someone out there may enjoy it as well. Personally I don’t think it was written by a 21 year old but rather someone quite a bit older who has seen the steady decline of standards over the years. This was written by a 21 year old woman who gets it. It’s her future she’s worried about and this is how she feels about the social welfare system that she’s being forced to live in! These solutions are just common sense in her opinion. Put me in charge of benefit payments. I’d get rid of cash payments and provide vouchers for 50kg bags of rice and beans, blocks of cheese, basic sanitary items and all the powdered milk you can use. If you want steak, burgers, takeaway and junk food, then get a job. Put me in charge of health care. The first thing I’d do is to get women to have birth control implants. Then, we’ll test recipients for drugs, alcohol, and nicotine. If you want to reproduce, use drugs, drink alcohol or smoke, then get a job. Put me in charge of local authority housing. Ever live in military barracks? You will maintain our property in a clean and good state of repair. Your “home” will be subject to inspections anytime and possessions will be inventoried. If you want a plasma TV or Xbox 360, then get a job and your own place. Put me in charge of compulsory job search. You will either search for employment each week no matter what the job or you will report for community work. This may be clearing the roadways and open spaces of rubbish, painting and repairing public housing, whatever we find for you. We will sell your 22 inch rims and low profile tyres and your dooff dooff stereo and speakers and put that money toward the common good. Before you write that I’ve violated someone’s rights, realize that all of the above is voluntary. If you want tax payers hard earned cash and housing assistance, accept the rules.. Before you say that this would be “demeaning” and ruin someone’s “self-esteem,” consider that it wasn’t that long ago that taking someone else’s money for doing absolutely nothing was demeaning and lowered self-esteem. If we are expected to pay for other people’s mistakes we should at least attempt to make them learn from their bad choices. The current system rewards those for continuing to make bad choices. AND While you are on benefit income you no longer have the right to VOTE! For you to vote would be a conflict of interest….. If you want to vote, then get a job. The government is meant to work for the people of this country, so they should not get a bonus unless we the working people agree that they have achieved their objectives. They should not get increases unless we the working people agree they get increases. They should be accountable to the people for every cent spent and if they can’t account for everything they should be let go. They should never be allowed to drive fancy cars, live in fancy houses, spend millions for security until they have kept every single promise they have made. Then we will see how many people actually want to “run/ruin” the country because they actually care about the people and care about our future. The true revolution is when we the people wake up to the fact that we are being taken for a ride by a small handful of VIPs. How can we be so blind to the obvious? Who, me worry in Africa? As the rest of the world watched the memorial service for the late Nelson Mandela, a very serious breach of security was playing itself out right next to Pres Obama. It has since come out in the washing, that the person contracted to do the sign language translation was not capable or accredited to do so. He also had no security clearance and is currently under investigation for murder. In our history here in South Africa, we had another breach of security when in 1966 Dimitry Tsafendas stabbed Dr. Verwoerd to death in the House of Assembly. Tsafendas (who I actually met years later, but that is a story for another day) gained access by posing as a messenger and walked right up to Verwoerd. Before anybody realised what was happening he pulled out a knife and stabbed Verwoerd to death. I am just glad that nothing like this happened at the memorial service, but it could just as easily have happened. My mind boggles at the repercussions that would have swept across the world if Obama had been killed by a man who the ANC had previously hired for their gathering in Bloemfontein and has now been classed as “unstable”. 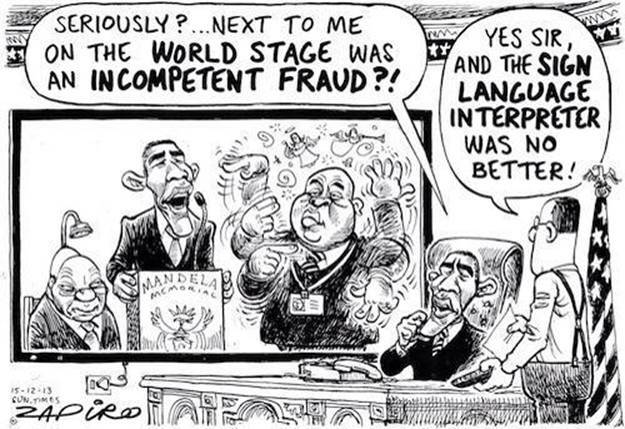 At least Zapiro once again came to the rescue, and injected a bit of humour here. For those who haven’t seen the cartoon – ENJOY! !